You can build the White House, the Lincoln Memorial, the United Nations Headquarters, and many more famous buildings using Lego building blocks. If you wish, after you create the buildings, you can reuse the blocks for other projects, but many people prefer to keep these as show pieces, much the same way model car aficionados do. Building these kits while studying government, geography, or history is a great way to help learners conceptualize learning material. With a large range of kits available, you can make some incredible plastic sculptures, but you don't have to limit yourself to pre-designed kits. With imagination, some time, and a LOT of LEGOs, you can build almost anything! With Legos, you can build almost anything! Homeschool families can use the Architecture kits and the Creator kits to support history and geography lessons. At the same time, they can be used for the art class, too. There are more than twenty architecture Lego sets, including Rockefeller Center, Sears Tower, John Hancock Center, Empire State Building, Seattle Space Needle, Solomon R. Guggenheim Museum®, Fallingwater®, Sungnyemun, Trevi Fountain, Burj Khalifa Dubai, the White House, and many more. 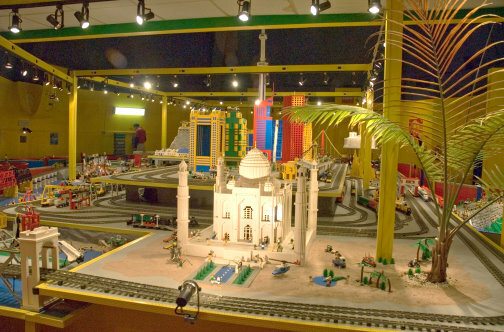 The discontinued Taj Mahal (very rare) is also available at times, but likely to be out of the homeschool school budget. Maybe You can be a Lego Artist! Artists like Sean Kenney, Nathan Saway, DecoJim, Adam Reed Tucker, and Holger Matthes create detailed and fantastic models of architecture and other art from the ground up using LEGOs. It really is true that only the limits of one's imagination restrict what can be done with these wonderful blocks. Legos are fun for the entire family. They help small children learn fine motor skills, and help older children to learn architecture, design, planning, and more. They support history, geography, art, and architecture classes for homeschool students.